BTC- Public-private partnerships are known for behavior we compare to vultures. Scavenging birds circling your tax payout to contract goods and services that may, or may not, directly benefit you. In the following example, the identity industry has the most to gain from mandating national identity standards to pursue life normally. Basic standards for a nationalized ID card are a far cry from what some of these corporations urge our government to endorse: massive database systems, biometric face prints, RFID, DNA laminates and now fingerprints in order to secure legal working status. Fingerprinting is one solution proposed to curb illegal immigration. There have been recent murmurs on Capitol Hill, that NY Senator Chuck Schumer has got a walking agenda for the biometrics industry based on immigration reform. He has plans to propel legislation requiring everyone to submit copies of their fingerprints in order to have the right to work in the United States. "There is only one way to really get a system that will stop illegal immigration and stop employers from hiring, and that is by creating a biometric-based Federal employment verification system that will give both employers and employees the peace of mind that employment relationships are both lawful and proper. It will also give the American people the same peace of mind. This system will be our most important asset in dramatically reducing the number of illegal aliens who are able to live and work in the United States. ...I am eager to enact comprehensive reform with a strong, tough employer verification system." We disagree with Schumer. Erecting fingerprint standards as a gate to one's right to work does not lend peace of mind for those with concerns about privacy. We believe Shumer's recent motivation to act on universal fingerprinting may have something to do with standards identity industry corporations set themselves. They propel their agenda onto Congressional leaders with a soft spot for certain lobbyists. WASHINGTON/PRNewswire -The Identity Theft Prevention and Identity Management Standards Panel (IDSP) released a workshop report calling for the development of an American National Standard on identity verification as a tool to help combat terrorism and identity theft. The IDSP workshop and report were driven by recognized vulnerabilities in the issuance of foundational documents used to prove identity, in particular the birth certificate. Since agencies typically rely on but do not verify birth certificates and other source credentials such as driver's licenses and Social Security cards used to establish identity, there is a loophole where identity theft and fraud can occur. A project plan was developed and a team formed to take this work forward under the leadership of the North American Security Products Organization (NASPO), an ANSI-accredited standards developer. See www.naspo.info for a summary of the work done to develop identity verification guidelines. "Participants in the workshop concluded that a common systematic process is needed to achieve a level of assurance whether to accept or reject a person's claim of identity," said Dr. Graham Whitehead, director of standards development for NASPO and the project's leader. "A strong identity verification process will go a long way toward preventing credentials from getting into the hands of terrorists and identity criminals." The report cites other envisioned benefits of identity verification guidelines to [...] enhance the security and credibility of government and commercial credentials issued downstream, such as public and private-sector employment identification cards, U.S. passports, Medicare / Medicaid cards, and credit/charge cards. We followed the breadcrumbs to NASPO's site and guess what? The public review period to include you, John Q. Public, is now closed. It's not like you were really solicited or invited anyway, right? That is not how it works. NASPO is paid to figure out how to make the identity industry a lot of money. Since the biometrics industry has earned a big brother reputation and is despised by populist groups, it would be a real downer for them to hear from a taxpayer at one of these meetings. Here is how it should work. The people set the standards of what they will and won't pay for. Institutionally indoctrinated people in the U.S. : military service members, prisoners, school employees, social service & government workers and state health employees all surrender fingerprinted identity to a government crucible as part of their service to our society. However, plenty of citizens avoid those lines of work due to the bureaucratic demands on their person. The burden of proof is pushed onto the citizen and not the institution. It's very difficult for the average citizen to simply eat another form of identity based on the elusive plan to identify terrorists and unlawful immigrants. It is expensive and lazy to paint all Americans with the same brush as those here without "papers". If supplying accurate documents to your employer is not enough to verify you are who you say you are, along with a hair and urine sample in some cases, fingerprints won't be enough either. So let's stick to the objective. The path to immigration reform relies on US companies to deny employment to immigrants unlawfully present in the U.S.
Let's look at a State strategy that actually had some success. Arizona revokes business licenses of those who employ unlawful immigrants. More often than not, businesses who are "busted" cut a deal. If they agree to let all of the unlawful labor go, the State allows them to stay in business. It's a strategy that works better than burdening workers with the costs to submit their fingerprints to be employed, with no reliable results, and indefinite record detention. Let's encourage our public officials to try another strategy regardless of baited recommendations of the identity industry rather than accepting biometric identity as a standard requirement to work. It is not "the only way"to achieve immigration reform as Schumer may claim. Bryce Williams wasn't expecting to walk through a metal detector or have his bags screened for explosives at the Greyhound bus terminal near downtown Orlando. But Williams and 689 other passengers went through tougher-than-normal security procedures Thursday as part of a random check coordinated by the U.S. Although the TSA is best known for its agents at airports, the agency's Visible Intermodal Prevention and Response, or VIPR, teams stage periodic operations at bus and train stations, ports and other transportation centers. They began work in December 2006. Thursday's daylong event was the first at a Greyhound station in Florida, said John Daly, TSA security director for the Orlando region. Ashley Hartman, 23, arrived in the late afternoon from Tampa and was planning to transfer in Orlando to a bus bound for her home in Delaware. She told a security agent about the stun gun in her book bag that she carries for protection, and officials at the terminal helped her ship it home; stun guns are prohibited on buses, a TSA spokeswoman said. "I think they have to have that with everything that's going on after 9-11," said Hartman, who was on her way home from a seasonal job running carnival games. Normally, two security agents are on duty at the bus terminal, said Emma J. Gray, Greyhound district manager. They use a hand-held metal detector to scan people and also inspect luggage by hand, she said. On Thursday, 50 officials from agencies including TSA, Orlando police, the Orange County Sheriff's Office, and U.S. Customs and Border Protection patted down passengers. Behavior and explosives experts and dogs trained to sniff out bombs and drugs also were used. Everyone who walked into the terminal went through a metal detector like those at airports, and baggage was screened for explosives. Five people were arrested on illegal-immigration charges, and one person was picked up on a local warrant. Glass bottles, knives, a bullet and the stun gun were found. Michael Neal, 66, of Nottingham, England, was forced to remove a box cutter from his carry-on bag and place it in his checked luggage. He said he uses it to peel fruit, and he didn't mind the slight inconvenience. "No problem," said the retired butcher, who is traveling around the U.S. on vacation. "It's for your own safety, really . " But Williams, 49, and his son, Brice Williams, 20, were on their way to Minneapolis and weren't happy with the high level of security, particularly after they were forced to shift some tools from a carry-on bag to checked luggage. Father and son said they skipped the airport because of the security hassles. Now, they're rethinking their choice. "I'm driving from now on," Bryce Williams said. It's quizzical to me and many others why the Internet needs any regulation. Open source platforms don't require any interference. Nevertheless, everyone who uses the Internet should be considering what would be gained or lost when it comes to web governance, myself included. First, I needed to do some research. I started looking for more and any information on the debate outside of expert conventions. This, of course, was just to explore what's out there. And that is when I found NetCompetition.org - an e-forum promoting competitive Internet choices for consumers. They explain the arguments for and against Net Neutrality and give updates on what is actually happening in the struggle for control of web communication. As a fallback position, I applied a convenient personal algorithm to any government propulsion league like the FCC: that which governs least, governs best. I've recently become quite spoiled by unregulated free speech, as a blogger and online talk radio host. It is really nice not to worry about hefty fines for dropping an f-bomb. When I think of a society where the government regulates communication, specifically the internet, I think of China. China doesn't have a super high jail population. So who are the criminals in their jails? Sometimes, it is people like muckraking journalists and other "dissidents" who spoke up against totalitarian governance. China pinches off access to sites in order to control populist communication. Their people cannot view things the government interprets as wrong for the country. So regulation of the internet can be done, because it was done in China. A unique problem in America, and unfortunately the world, is when we can't reign in U.S. corporations for being criminal and unethical reckless destroyers of private property, human life, and perpetual occupying aggressors in foreign nations on the public dime. That is why giving the FCC the go ahead in this arena seems to be a different face of the same group of power grabbing corporations. Special interests step in and tell the government what they want to happen. Balance is required. Important questions asked are: do we regulate businesses so they won't dominate what people get to see? Or ... Do we not regulate the open source wild west we all know and love? Is it really that free anymore and is the party really over? "A straightforward repeal of Real ID is too much for our Congress to handle at this point," Harper said. "There isn't any love for Real ID in Capitol Hill. Most in the Senate and the House don't want it." The Real ID Act was approved by Congress and signed into law by President Bush in 2005 as part of the government's effort to combat terrorism. The law requires states to follow a single national standard for identifying and authenticating people who apply for a driver's license. It spells out specific technical and process requirements, including the use of biometric identifiers, for issuing licenses. But the law has evoked widespread criticism from privacy advocates and civil rights groups who say it would create a de facto national identity card system that would be hard to manage and even harder to secure. Several have expressed particular concern over a Real ID requirement that all state driver's license databases be linked via a central hub for easier information sharing. Even the DHS itself, which is responsible for implementing the Act, has expressed reservations about Real ID security, privacy and logistics. DHS Secretary Janet Napolitano, in fact, was one of the first to reject Real ID when she was the governor of Arizona -- a fact that many have said makes it especially hard for her to now try and push it on other states. In a bid to make the idea of a national identity standard more palatable to states, several U.S. senators earlier this year introduced a bill proposing some revisions to Real ID . That "Providing for Additional Security in States' Identification" Act of 2009," or Pass ID Act, has the same goal as Real ID, minus some of its more controversial provisions. Pam Dixon, executive director of the World Privacy Forum, said that the proposed budget cuts make it impossible for Real ID to move forward in its present incarnation. "Congress is looking at this realistically and saying that states simply do not have the money to implement Real ID," she said. "For all intents and purposes, real ID has been put on the back-burner. But it isn't dead, yet." This is true in some respects, and not in others. As I noted before, PASS ID is on a tighter implementation schedule which is the main driver of costs. Because it’s federal, this is something that CBO actually knows about, and its assessment is that PASS ID would dole out a total of $123 million to states over the next five years. Washington, D.C.’s highest spending year would be fiscal 2013, in which it would spend $39 million, less than $1 million per state. And those savings when the federal government doesn’t charge states for using its databases? Just $2 million each year in fiscal 2010 and 2011. Nothing in the CBO estimate changes the conclusion that implementing a national ID would cost states over $10 billion dollars, as they hired new staff, acquired new equipment and systems, and marched 250 million Americans through their DMVs. The federal government is promising to dole out $123 million and offer states a whopping $4 million in savings on data access. The National Governors Association’s argument that PASS ID reduces costs to states is ludicrous. And the paltry funds Congress might share with states is a drop in the bucket. The homeland security appropriations bill for fiscal 2010 cuts funding for REAL ID by $40 million from its 2009 funding level. PASS ID would fare no better. State governors and legislatures that have fallen for the PASS ID cost estimates of the National Governors Association and National Conference of State Legislatures should fire these financial advisors. NGA and NCSL are trying to grow federal power at the expense of state coffers. When President Obama designated $19.5 billion to expand the use of electronic medical records, former House speaker Newt Gingrich (R-Ga.) said it was one of only "two good things" in February's stimulus package. But such bipartisan enthusiasm has obscured questions about the effectiveness of health information technology products, critics say. Interviews with more than two dozen doctors, academics, patients and computer programmers suggest that computer systems can increase errors, add hours to doctors' workloads and compromise patient care. "Health IT can be beneficial, but many current systems are clunky, counterintuitive and in some cases dangerous," said Ross Koppel, a sociologist at the University of Pennsylvania School of Medicine who published a key study on electronic medical records in 2005. But health IT's effectiveness is unclear. Researchers at the University of Minnesota found in March that electronic records prevented only two infections a year. A 2005 report in the journal Pediatrics found that deaths at the children's hospital at the University of Pittsburgh Medical Center more than doubled in the five months after a computerized order-entry system went online. UPMC said the study had not found that technology caused the rise in mortality and maintained that medication errors were down 60 percent since computers were introduced in 2002. On Oct. 16, the panel wrote to 10 major sellers of electronic record systems, demanding to know, for example, what steps they had taken to safeguard patients. "Every accountability measure ought to be used to track the stimulus money invested in health information technology," said Sen. Charles E. Grassley (Iowa), the panel's ranking Republican. -- Faulty software that miscalculated intracranial pressures and mixed up kilograms and pounds. -- A computer system that systematically gave adult doses of medications to children. -- An IT program designed to warn physicians about wrong dosages that was disconnected when the vendor updated the system, leading to incorrect dosing. -- A software bug that misdiagnosed five people with herpes. Over the next two months, Blumenthal will finalize the definition of "meaningful use," the standard that hospitals and physicians will have to reach before qualifying for health IT stimulus funds. He would not say whether applicants would have to submit adverse-event reports, a safety net that many doctors and academics have called for but that vendors have resisted. In Britain, a $20 billion program to digitalize medicine across the National Health Service is five years behind schedule and heavily over budget. A British parliamentary committee in January criticized the vendor, Cerner, as "not providing value for money." Cerner's stock price has risen 122 percent since February. Shares in Allscripts, another major health IT player whose chief executive, Glen E. Tullman, served on Obama's campaign finance committee, rose by 126 percent over the same period. "It's been a complete nightmare," said Steve Chabala, an emergency room physician at St. Mary Mercy Hospital in Livonia, Mich., which switched to electronic records three years ago. "I can't see my patients because I'm at a screen entering data." Last year, his department found that physicians spent nearly five of every 10 hours on a computer, he said. "I sit down and log on to a computer 60 times every shift. Physician productivity and satisfaction have fallen off a cliff." Other doctors spoke of cluttered screens, unresponsive vendors and illogical displays. "It's a huge safety issue," said Christine Sinsky, an internist in Dubuque, Iowa, whose practice implemented electronic records six years ago. "I can't tell from the medical display whether a patient is receiving 4mg or 8mg of a certain drug. It took us two years to get a back-button on our [Electronic Health Record] browser." More than one in five hospital medication errors reported last year -- 27,969 out of 133,662 -- were caused at least partly by computers, according to data submitted by 379 hospitals to Quantros Inc., a health-care information company. Paper-based errors caused 10,954 errors, the data showed. "Doctors who report problems can lose their jobs," Hoffman said. "Hospitals don't have any incentive to do so and may be in breach of contract if they do." For one senior internist at a major hospital, who requested anonymity because he said he would lose his job if he went public, a 2006 installation provoked mayhem. "The system crashed soon after it went online," he said. "I walked in to find no records on any patients. It was like being on the moon without oxygen." "I told him I had a right to continue. They pulled my computers, tried to limit my access, took me off sniper duty, and put me on guard duty of Iraqis on base. The last two months were lonely and difficult for me. I was afraid I would be court-martialed. In the end, it was determined that nothing I wrote had violated operational security and that I had committed no treason and, since there were no rules prohibiting blogging, I had broken no rules either. But I was continually hazed by my superiors as long as I was there.... They were constantly looking for ways to trap me. I was made to fill sandbags and do other menial jobs. However, I was finally awarded an honorable discharge in May 2005, and gained a lot of respect from most of my fellow soldiers. 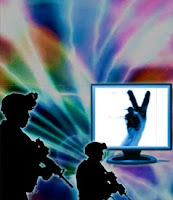 Many would give me the peace sign as they passed me by," Garett Reppenhagen, IVAW. If technology has transformed warfare into a spectacle of shock and awe, its contribution to the cause of dissent has been no less remarkable. It has enabled solidarities across borders and facilitated networks and forums dedicated to impartial communication of ground realities beyond the sanitized projection of mainstream news. True, technological advances have not brought an end to either occupation, but it has certainly helped alternative voices and views to be heard. Many American soldiers in Iraq and Afghanistan have been confounded by the wall of censorship they confront, jointly constructed by the military and the corporate media. The Internet offered them a convenient and powerful channel through which to get their stories out to the public. Constrained by slow military mail service from Iraq and Afghanistan, not to mention overt attempts by superiors to curtail their interaction with journalists, soldiers have long since taken to blogging, posting photographs and uploading videos online, all related to their experience of the occupations. "There is nothing that I feel can alleviate the guilt for being directly involved with our illegal and immoral occupation of Iraq. I ask myself from time to time, "Why was I so afraid to resist the order to go to war? Why didn't I object to the whole damned thing?" I have been told many times not to be ashamed for my service to this country, but I can't help a genuine intuition that this war is not designed to promote freedom and our beautiful American way of life, but instead only carried out to proliferate Western imperialism and corporate profits every time a bullet is fired. My guilt is synonymous with the sentiment that I was indeed on the wrong side of the wire."